Dan Drachman, a Hopkins neurologist and accomplished clarinetist, came to his love of music on his own. But his marriage to the daughter of famous cellist Gregor Piatigorsky turned music into a family affair. "Who do you think you are — Piatigorsky?" Kids in the '50s would bandy the name about for any pal who sat on a piano bench or carried a violin case on the school bus. It didn't matter that Piatigorsky was the Russian-born cellist whose 40-year-long concert tour at last made that instrument respectable for solo playing. Children just liked saying Pi-at-a-GOR-sky and knowing the name of someone important. A more mature sense of homage was behind a Shriver Hall Concert Series special event that packed this Homewood campus auditorium last May. To honor the 100th anniversary of Gregor Piatigorsky's birth, a celebration alternated photos and film footage of his life with the playing of eight cellists of world-renown — Tchaikovsky International medalists, pillars of symphony orchestras, virtuosos, all — who had learned from the maestro. The combination gently fixed in concert-goers' minds how rare a soul the cellist was. By concert's end, you sensed the power of music as a human endeavor. You felt regret at not knowing Piatigorsky personally. Yet another man, also transformed by music, though in a more complex way, stood out that afternoon. Even surrounded by the intermission crowd, it was hard to ignore Dan Drachman. A head taller than most, Drachman resembles Piatigorsky: the height, the kind eyes, broad shoulders, and the longer-than-usual stretch of jaw. Drachman is best known at Johns Hopkins as a neurologist. He helped found the School of Medicine's Department of Neurology; today, he directs its largest subgroup, the Neuromuscular Program, which he started some 30 years ago to foster understanding of the natural harmony between nerve and muscle and to resolve such bodily discords as myasthenia gravis and muscular dystrophy. His peers say he is the world's expert on the former disease, an autoimmune blocker of nerve-to-muscle impulses that affects about one person in 10,000. But in a way that is unusual for a physician, music has helped define Dan Drachman's life. Drachman is married to Piatigorsky's daughter, Jephta. ("Yes, I know Dan resembles my father," she says.) Their son Evan, the last solo performer at last May's concert, is an accomplished international cellist who plays eerily like his grandfather. Drachman himself excels at the clarinet. In fact, Piatigorsky, after listening to his son-in-law, was moved to describe him as "the best amateur musician I know." Moreover, Drachman's medical talents as neurologist to musicians have drawn a following that has included Dmitri Shostakovich and others who are regulars in this country's concert halls. Drachman takes the same approach to his medical research as he takes to his music (see p. 31). "I don't play the piano and I don't think I would have played it very well," he says. "The piano, and its harmony or counterpoint with the left hand — that takes a whole different mentality. On the clarinet, purity of tone and the single melody is paramount. The logic of the melody is what's appealing. The one line. That's the sort of way I do life." John Griffin, who heads Neurology at the School of Medicine, agrees: "Dan is absolutely tenacious around the questions he's asking. In myasthenia gravis, for example, he's taken the basic question — what is this disease? — and continued to dissect it, confirm, and expand it over 30 years. He's produced an enormous body of work, with individual discrete pieces. But there's a theme he returns to throughout. Today, where there's such a temptation for researchers to dart from area to area, that's less often the case. "That's not to say Dan has tunnel vision," Griffin continues. "He's probably published more articles on different things in Science and Nature than anyone else at the school — things that will take his interest, but always as side projects. It's like experimenting with a different style, and coming back." "As for me, I felt like the Indian brave who'd killed the buffalo to get his chief's feather," says Dan Drachman of his engagement to Jephta. Drachman's entry into music was unremarkable, he explains one Sunday afternoon at his home in Baltimore County, in a room made remarkable by Jephta's animal sculptures. Drachman played a soprano sax for the usual reasons any 7-year-old would — "it was large and noisy" — and later switched to clarinet on the advice of his music teacher. "He got me a Buffet clarinet, a French instrument. 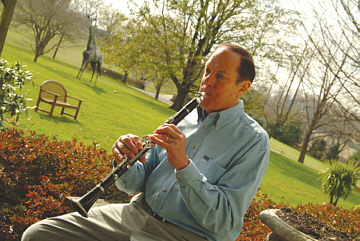 To this day, it's my favorite B-flat clarinet," Drachman says. "Neighborhood teachers gave me the standard 'Oodles of Noodles, Flight of the Bumblebee' sort of stuff," Drachman explains. "And that was fine. Then, in high school, one of them said, 'Here, try this.' It was the Mozart clarinet concerto." Drachman enjoyed the foray into "real" classical music, but it wasn't life-altering. University called, then medical school at New York University. "I still played the clarinet, but to myself, to unwind," he says. One rare free Saturday afternoon while he was interning in Boston at Beth Israel Hospital, Drachman was holding forth in his room. A passing resident, who played the violin, heard him and said, "There's a guy on Beacon Hill who does chamber music evenings. Want to come?" A world opened up. During residency, the grinding work and exhilaration of being at the Harvard neurological unit at Boston City Hospital were punctuated by small holes in time, when he and several other musicians got together. Drachman found himself playing the Mozart clarinet quintet, the Brahms clarinet quintet, the Beethoven clarinet trio. Remembering those interludes, Drachman leans forward in his chair. His voice drops and his eyes widen: "We played a lot. I loved it. I was hooked." 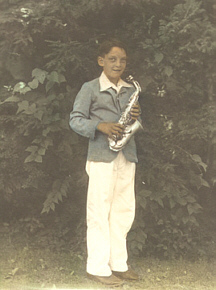 Young Dan Drachman played the soprano sax because "it was large and noisy." Photo courtesy Dan Drachman Adding to the headiness of the time, he met a lissome, artistic young woman just graduated from Wellesley who skied and, like Drachman, loved music. He and Jephta dated a little, then she tried a semester teaching math in Los Angeles, where her family lived, but it didn't stick. Following her father on tour, she again crossed paths with Drachman in Boston. This time Jephta's mother, who had met the young man and who knew a good thing when she saw it, prompted Jephta to register at Boston University's art school, installed her in an apartment, and, according to Drachman, "started to spin a web." At the end of Drachman's residency, Jephta's mother invited him for a week at their house in Los Angeles, adding, "Bring your clarinet." Drachman remembers his excitement. Chamber music with Piatigorsky! He had grown to love the warm, affectionate Piatigorsky family, but, still, he felt a twinge. "Who else will be there?" he asked Jephta. "Just my father and some friends," she replied. So on the evening of the day he proposed to Jephta, he played chamber music with Piatigorsky, Jascha Heifitz, and Artur Rubenstein for the first time in front of his new family — "with all of musical Los Angeles sitting in their living room." "It's still vivid," says Drachman. "I'd felt supercharged. Jet engines full-throttle. Fireworks. The whole thing." When it was over, Grisha — as family called Piatigorsky — announced the engagement to everyone. "He was pleased, I could tell," Drachman says. "As for me, I felt like the Indian brave who'd killed the buffalo to get his chief's feather." 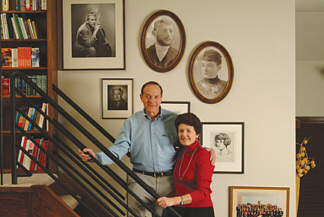 Dan and Jephta Drachman's photo gallery includes a well-known image of Piatigorsky, in the upper left-hand corner. After three years of neuroembryology work at the National Institutes of Health and six years on the faculty at Tufts, Drachman, with Jephta and their now-growing family — three sons — moved to Johns Hopkins in 1969. 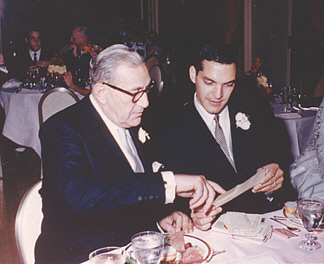 Drachman's plate had always been full, with a research laboratory to direct and an active clinical practice. But in his clinic the neurologist made time for musicians and their specialized problems. Word travels prestissimo in the music community. Once, the principal contra-bassoonist from an East Coast orchestra visited Drachman, certain he had multiple sclerosis. "He felt a not-infrequent tingling and malaise, and I examined him. But I knew he wasn't suffering from MS," recalls the neurologist. "Contra-bassoonists blow out a lot of air when they're playing. With that goes a lot of carbon dioxide. Even when they're not playing, they tend to breathe out too much. Hyperventilation changes blood chemistry. It leads to numbness around the lips and the fingertips. That was in my mind when I had him bring his bassoon to the hospital — you could admit people for observation then. I took my clarinet to the ward treatment room and set up three duets Beethoven wrote for bassoon and clarinet that are fairly continuous. Halfway through the first one, he cried, 'That's IT!' The tingling and numbness had returned. So I made him more aware of his breathing, and the problem went away." Another time Drachman got a call from a worried clarinetist. "'Dan,'" he said, 'I'm playing the Mozart clarinet concerto with George Szell and my pinkie hurts.' I watched him play; he was fine, no neurological problems. But he's short-fingered and had trouble hitting the C key, one of a cluster you play with your right pinkie. I told him to get the E-flat key cut down so he wouldn't have to reach around it." A small percentage of musicians have dystonia, the impaired movements or fixed posture of parts of the body. Drachman says that, in lesser form, it can be the equivalent of golfer's yips. Pianists can experience it as a constant cramp. "Before Botox, there wasn't much you could do; now it's made a dramatic difference," Drachman says. Years before he advised musicians to get Botox shots, Drachman had launched research on botulinum toxin's neuromuscular activity, using the bacterial toxin to clarify the role of nerve activity in sustaining muscle tissue. Since botox blocked nerves, it was a perfect tool. "I was too dumb at the time, though, to realize the importance," Drachman says. The 30-odd papers that he authored on the subject were what laid the groundwork for today's Botox phenomenon. Over the years, hundreds of musicians have enlisted his help. Drachman has advised many a violinist to change bowing position and, with judicious steroids, patched up frantic New York or Baltimore Symphony pianists so they're able to play an evening's concert. Some of the insights for string players must have come from his father-in-law. But it's not Piatigorsky's bowing technique that lingers for Drachman. "I got to know him well," says the neurologist, "and he was an extraordinary human being." When they first met, Drachman knew little about Piatigorsky's seat-of-the-pants upbringing in Russia. "It was funny, at first, but I wondered — he'd had no formal education — I wondered if music were all we could talk about." Like Drachman, Piatigorsky started playing at seven. But the cellist was soon helping his family, appearing in cafes, movie houses, and the occasional brothel. Essentially on his own by age 12, the cellist got by on good nature and the fact that his youth and his rough edges melted away when he picked up the bow. Drachman says his father-in-law was "full of life." "You'd be sitting around, watching TV, and he'd say, 'Let's go to the roller derby.'" Photo courtesy Dan Drachman Raw talent got Piatigorsky into the Moscow Conservatory. He survived pogroms, grasping landlords, and the tumultuous politics of Bolshevik Russia — he chatted warily with Lenin but found him affable — to become first cellist for the Bolshoi Opera Orchestra. After escaping into Poland (fording the river in a hail of bullets, holding the cello over his head, the stories go), the young man successively played for the Warsaw Orchestra, the Berlin Philharmonic, and then, as soloist, with symphonies worldwide. "He knew a tremendous amount, from a rich life lived with awareness," says Drachman. "We spent hours talking. Not just music, but anything. It had bothered me at first that he'd talk around things, that he was circuitous, until I realized he always had a purpose." Or as Jephta explains, after her father had finished talking, "there'd be an enlightenment." "I'd also wondered," says Drachman, "if his students were terrified of him. But that was hardly the case. One student in particular was timid from the start. My father-in-law would listen to him, then demonstrate. But the fellow got worse. Piatigorsky was tremendously intuitive, and realizing he was inhibiting the young man, he began making mistakes when he played. Later, someone asked the student, 'How's Piatigorsky as a teacher?' The reply was, 'He's very good, but he doesn't play the cello very well.'" Another student played rigidly, Drachman says. "My father-in-law saw the problem as psychological. He took a direct approach. 'When you come in my door, I want you to say, "I love you" as though you mean it.'" The student, Drachman says, was hugely embarrassed. "It took a while, but finally, he said the words, and about that time, his playing began to change." Drachman continues. "Piatigorsky was full of life. You'd be sitting around, watching TV, and he'd say, 'Let's go to the roller derby!' Though neither of us had ever been, it would suddenly be the thing to do." Not surprisingly, the Drachman household has been musical. "I play the flute a bit, mostly when no one's home," says Jephta. Since 1997, she has championed Baltimore chamber music as head of the board of directors for the Shriver Hall Concert Series, which was launched in 1966 by a committee of mostly Hopkins faculty who wanted to bring world-class classical music to the area. Under Jephta Drachman's leadership, subscriptions for the series have jumped from 300 to 700 in 2003-2004. The diversity of the performers, from household names to musical "finds" on the verge of fame, testifies to her skills. 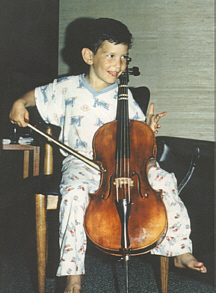 Evan Drachman, here age 4, plays eerily like his grandfather. Photo courtesy Dan Drachman All three Drachman sons had, at some time, asked for music lessons, though one, Drachman recalls, had to be bribed with a new dog to continue. "And I didn't really want a dog," adds the neurologist. But it was their eldest son who made Piatigorsky worry. "When Evan was in diapers," says Jephta, "he'd sit outside the closed door and listen to his grandfather practice — sometimes by the hour!" By the time Evan was 10, no doubts remained about his ability. The seeds of his grandfather's lyric sound, his ability to tell stories with his playing, had sprouted. But Grisha made the young man promise he wouldn't take the cello seriously. Evan Drachman once told an NPR interviewer about his grandfather, "He explained that if I were successful, I'd spend my life in hotels and airplanes and would be miserable. Or if I weren't successful, I'd be miserable that I wasn't miserable." "When Evan finally did get hooked," Jephta adds, "the promise troubled him. I reminded him that my father often said you don't choose music; it chooses you. He also said you don't go into music because you want to be a great soloist. You do it because you have to make art significant for people. To do that, you have to bring it to them." That's now what Evan Drachman is doing. After graduating from the Curtis Institute in Philadelphia, he studied at the Peabody under cellist Stephen Kates, who had learned from his grandfather. Now, as founder of the Piatigorsky Institute, a nonprofit dedicated to making live classical music accessible to all, Evan Drachman crosses the country, playing, teaching, and encouraging others by devising concerts. One of the most moving parts of the centennial concert came at the end, when a film clip showed a weary Piatigorsky taking his beloved 1725 Stradivarius out of its case, laying it on the sofa. The lights dimmed, then raised to show grandson Evan reaching for the same instrument, to play his grandfather's composition, "Prayer." "There's something about making music, not just listening, that opens everything up from the inside," says Dan Drachman. "Even if you don't have that much time to play, you need to do it. I'd never want to do without." Marjorie Centofanti writes from Severna Park, Maryland. Follow this link to "In Science, as in Music"